The 76,000 citizens of the little-known Danish municipality Sonderborg act, while politicians talk and climate change is accelerating. They share the vision of ProjectZero and have committed themselves to make Sonderborg zero carbon by 2029. Sonderborg is a picturesque municipality close to the water and the German border, and it wants to prove that climate neutrality is achievable when cities take decisive action and ensure citizens and companies participate in finding new solutions and retrofitting society’s energy consumption and generation. The ProjectZero visionary project is focused on transitioning Sonderborg into a ZERO carbon community, based on sustainable growth and creating new green jobs. Energy efficiency and energy from the area’s own renewable sources are the key means to turn the vision into reality. New thinking is essential and public policy and investments fuel the transition. Engage the citizens as co-designers of the Smart Zero Carbon Sonderborg ambition based integrated solutions, comprehensive learning and the introduction of new ICT based energy information. Sonderborg town is supplied with district heating from the Sonderborg District Heating company. The company has a mix of heating sources, including waste incineration, geothermal, solar and biomass, and natural gas for peak loads. Waste incineration is only counted as 50% renewable according to national standards, otherwise the city is mainly heated through renewables. There are five district heating companies supplying heat to the Sonderborg Municipality outside of the town, all with varying degrees of RES. Among these heating sources are solar, heat pump, gas turbine, immersion heater, and a planned straw-fired boiler that will be operational in 2019. Sonderborg Municipality produced 47GHh electricity from RES in 2016, which is 6 GWh less compared to 2015 mainly because of less wind. The goal for the Sonderborg area is to become CO2 neutral by 2029, which is planned in combination of reducing CO2 emissions by 50% compared to 2007 levels and covering the remaining consumption with 100% RES. Several larger companies along with private households have installed PV panels to cover their own electricity consumption, selling any surplus production to the grid. As a zero-carbon mobility solution, a considerable number of new energy-efficient biogas-fueled buses will be deployed in Sonderborg, while each of the buses can carry bikes on board for a combined trip. 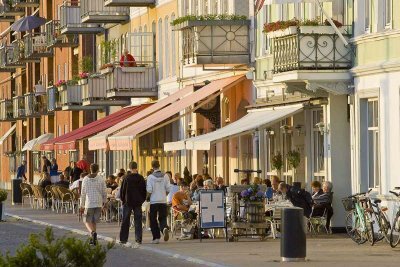 As part of Sonderborg’s official strategy to become a zero-carbon emission community by 2029, a citizen engagement program has been developed for involving local housing associations in retrofitting activities. In Sonderborg, a total of 45 social housing apartment buildings will be fully retrofitted to reduce energy consumption, improve indoor climate and support Sonderborg in becoming a carbon-neutral city in 2029.